Come the End is a brand new original play written by Elliot Bigden (left). 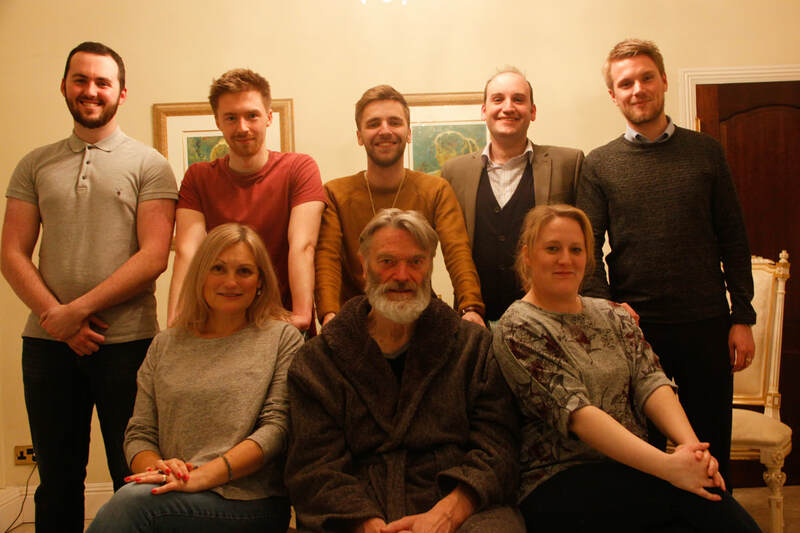 It has been a steady work in progress for Elliot, 23, from Hadleigh, who has been developing and working on the play for just over 2 years and, following a read through of the play last year, it was brought to the attention of Southend Shakespeare Company's Malcolm Toll. Malcolm, who has been involved in many productions with the SSC clearly saw potential in Elliot's creation and they came to an agreement whereby Malcolm volunteered his extensive directing expertise to the play, leaving Elliot free to concentrate on producing and casting. With a date and venue fixed for 12th and 13th January at Westcliff's Palace Theatre, Dixon Studio, all that Elliot and Malcolm now needed was a cast. Auditions brought forth a plethora of some of Southend's most talented performers, all of whom came from varying different local amateur groups and have a wealth of experience treading the boards, who were finally chosen for the eight roles up for grabs. I was invited to watch and review one of the final run throughs of the play and have to admit that I was pretty impressed with the performance level achieved by Musketeer Theatre Company in such a short space of time. Malcolm, who in the past has directed Shakespeare, Arthur Miller and Pinter plays to name but a few, says, "It's been wonderful to direct something completely new, especially with the author sitting right next to you but I said to Elliot that if he was happy for me to direct it, he would have to accept that I will change things, to a certain degree. So the piece has evolved somewhat in that respect." Elliot, who is no stranger to performing himself having appeared as Chadwick in Punk Rock, Romeo, in Romeo & Juliet, and more recently, Malcolm in Macbeth, tells me, "People's interpretations of their parts have been very interesting to hear and that has also helped with the way the play has evolved. I've had lots of comments about it being similar in style to a Joe Orton play." The play is set in a run down old house belonging to the dying Craster, who has invited his relatives to be with him during his final hours. The opening scene introduces us to Craster, aided by his doctor and his solicitor, who is there to dish out the news of what each relative will receive from the old man's Last Will and Testament. Any ideas of this being a sad and sentimental tale are soon dismissed as we meet each over-the-top character into this tragic yet farcical scenario. We have Craster's selfish daughter, Ethel and her bullying northern husband, Charles; neither of whom show any form of emotional attachment to the dying man and even less for their floaty, daydream of a son, Isaac, who has briefly met and become engaged to the voluptuous, money-grabbing, Elisa. Elisa is clearly not the type of girl who Isaac's parents would choose as daughter-in-law material. Enter Craster's son, the sleazy, Jack-the-lad Dennis, and all too suddenly the imminent implosion of a wholly dysfunctional family unit is upon us, complete with a few twists and turns to keep the audiences' attention fully engaged. With the introduction of such grotesque characters you cannot fail to find the humour in this piece and there are plenty of laughs to be had along the way, not least from Daniel Steward as randy Dennis and the delightfully over-the-top Elisa played by Lizzie Smith. Benton Hodges wonderfully endears with his characterisation of the hapless poet, Isaac, who simply cannot understand why his family can't see things from his point of view. Vanessa Osborn and Jonny Buxton as his loveless parents, the alcoholic Ethel and greedy bully, Charles, both put in great performances with Keith Chanter as the old grump, Craster, who probably has the most difficult role, having to play the dying father and grandfather amidst all the chaos of of his family's bickering, all the while sat in the same armchair throughout. This play may not have the most original plot line but Bigden has managed to find a uniqueness in all of the characters he has formed in Come the End and in this first attempt as a playwright, really understands how to keep the audience entertained, despite having some slightly surreal and obscure moments, which I assume can be put down to artistic licence. There is a good pace to this production which Malcolm Toll as director has managed to keep at a good flow and never allows the audience's attention to wain for one moment. There is even a slight cliffhanger at the end of Act 1 leaving the audience wanting more with plenty of questions to be answered in Act 2 and certainly the guarantee of more laughs! If you think some of the faces in this production are familiar, it's highly likely that you will have seen at least one of two of them in one of the many productions performed at the Dixon Studio or Palace Theatre. Tom has recently appeared in Lindisfarne's Rope and also played Danny in Grease with Solomons; Benton also appeared in Rope. Daniel has produced and directed plays for 1912 Theatre Company, most notably, The Ladykillers and appeared in Motortown last year with Triple Helix. Jonny Buxton is a regular with Southend Operatic Society who has recently appeared in Singin' in the Rain and as Franz Liebkind in The Producers. Nick is now a professional actor but has just finished directing Singin' in the Rain for SODS and has performed with Theatre of Heaven and Hell. Vanessa Osborn has played numerous roles with the Southend Shakespeare Company including Lady Macbeth, Titania in Midsummer Night's Dream and Viola in Twelfth Night. Lizzie Smith has also played Lady Macbeth and had audiences in tears with her portrayal of May in Lindisfarne's Accrington Pals. The member of the cast who may be the most familiar is Keith Chanter whose favourite parts have been King Lear, Oberon in Midsummer Night's Dream and Brutus in Julius Caesar for the Southend Shakespeare Company but people may be more familiar with Keith's dulcet tones and alter ego, Keith Rogers, who started his career as a pirate dj with Radio Northsea International and then Radio Orwell and who can still be heard today as a presenter on local radio station, Phoenix 98 FM every week day at 3pm. Something that all the cast agree on is that they have relished the opportunity of appearing in an original production as well as having the novelty of having the author sitting in and watching every rehearsal; they are all hugely supportive of Elliot and the play. One thing that Elliot is looking forward to more than anything is that exciting, tense moment when the first night audience sit down to watch the premier of his very first play. I ask Elliot what he is anticipating the most when this moment comes and he replies, "Hopefully hearing the laughter of the audience." Somehow, I don't think he'll have to wait for long.